The short version is that I grew up in Jamaica and New York. I’m a graduate of Hunter College and the Iowa Writers’ Workshop. I write stories about Jamaicans. I’m interested in the Jamaican diaspora and in Caribbean feminism. I published my first book, a collection of short stories, called “How to Love a Jamaican” in the U.S. and the U.K. in 2018. Some people had nice things to say about HTLAJ. I’m at work on a novel. The longer story is that I was born in Mandeville, Jamaica. We moved to New York when I was twelve—my mother, like many immigrant mothers, believed that she could better provide for her three children in the States, where three of her sisters lived. As a child, moving to the United States was a fulfilled dream because I had observed that everyone believed that the U.S. was superior to any other place in the world. The realities were different, painful—I was navigating the distance from the country of my childhood, and the fact that my family wanted so badly to build a future in a country that was unwelcome to foreigners. As I grew, in some ways I recognized myself as an American and in other ways I was Jamaican. Over time, I started to explore this tension of belonging and distance through my writing. 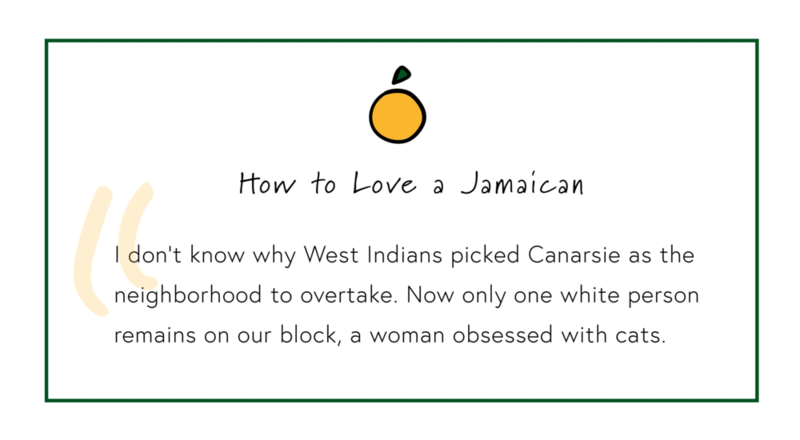 I started writing “How to Love a Jamaican” when I was twenty-four and finished when I was twenty-eight, but in a way it feels that I was writing those stories for even longer than that because I’ve been asking certain questions since I was a kid. I’ve always loved storytelling. Growing up, my parents in the Jamaican tradition were good storytellers. As a teenager, I would read under my sheets with a flashlight. I read YA novels about white suburban teenagers, girls who were unlike me in most ways, which intrigued me. The first book that inspired me as both a reader and writer was “The House on Mango Street” by Sandra Cisneros. It was the first time I read a book that reflected my urban, immigrant life, and the kinds of people I knew. I’ve wanted to be a writer since I was twelve. I tried for a long time to be something else, something more practical. I didn’t have the kind of economic upbringing where I could forsake everything to become a writer. I considered law school, or becoming a vet, which I might actually enjoy because I love animals. I really struggled emotionally after graduate school, when I was still living in Iowa City, working awful part-time jobs. I knew that if I moved back to New York to reunite with family and friends I would give up too much writing time in a job to make the high price of rent. There isn’t a roadmap for a creative life, and I felt especially lost coming from a family like mine, where everyone made more traditional career choices. I’m still figuring out what it means to be a creative, and to live a creative life. I feel so very grateful to share parts of myself, through my writing. If you’ve read anything I’ve written, thank you. I teach fiction writing, when the opportunity arises. I’ve taught high school students at the Iowa Young Writers’ Studio, undergraduates at the University of Iowa, and I facilitated a graduate workshop at the Iowa Writers’ Workshop during fall 2018. I live with two Persian cats, Cous Cous, who is twelve years old, and Fable, who is a few months old. They make me smile every day.